Hofschröer, Peter. 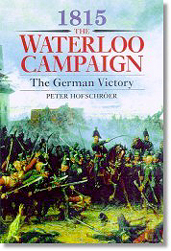 1815, The Waterloo Campaign: the German Victory. London: Greenhill Books, 1999. 384 Pages. ISBN# 1853673684. $49.95. Hardcover. In the sequel to his critically acclaimed 1815, The Waterloo Campaign: Wellington, his German Allies and the Battles of Ligny and Quatre Bras, Peter Hofschröer examines the second part of the campaign that ended Napoleon's reign in France. As in his first book, he continues to cover the campaign from the German perspective, not only the Prussian effort, but also the contribution of the contingents form the minor German states, including the King's German Legion, the Nassau troops, the Black Brunswickers, and the large number of Hannoverians. Mr. Hofschröer provides numerous firsthand accounts of the fighting, much of which has never been published before in English. There are accounts by Prussian privates, officers, and generals. One can read a description of the defense of Hougoumont by a Nassau officer who fought in the garden; Hannoverian accounts of what it was like to stand in a square while surrounded by French cavalry; and, even the official report of Major Baring, the Hannoverian officer who commanded the King's German Legion troops defending La Haye Sainte! For most readers, these first hand accounts will make buying the book worthwhile, however Mr. Hofschröer provides much more. He vividly describes the Herculean efforts of the Prussian Army to extricate itself from the defeat at Ligny and to link up with the Anglo-Allied Army at Waterloo. He uses first-hand accounts to describe the vicious fighting between the French Imperial Guard and the Prussians at the key village of Plancenoit, which protected Napoleon's rear. Unlike many other histories of the campaign, Mr. Hofschröer also chronicles the fight at Wavre and the successful retreat of Marshal Grouchy to France. In addition to his well-written description of the battle, he also provides detailed orders-of-battle and information on various formations, such as the North German Federal Army Corps. Fortunately for the reader, Mr. Hofschröer does not end the book with the defeat of Napoleon at Waterloo. Over half the book is devoted to the military events that occurred afterwards: the pursuit of the French back to France; the numerous skirmishes and clashes between the victorious Prussians and the demoralized French; and the race between the Prussians and the British to be the first in Paris. Mr. Hofschröer also covers a little known episode of the Waterloo Campaign that is rarely mentioned: the capture of the French fortresses by the Prussians. Despite the occupation of Paris in July, some French fortresses did not surrender until November - almost five months after Waterloo! Mr. Hofschröer closes with a summary of his thesis that the Duke of Wellington for many years after the battle deliberately misled the public on a variety of aspects of the campaign and downplayed the role of his Prussian allies, relegating their effort to one of secondary importance. He concludes the book with an explanation of why Waterloo was really a German victory rather than an Anglo-Allied one: the largest number of troops was German; they marched further; and they took the most casualties. The real value of The German Victory lays not so much in the strength or weakness of Mr. Hofschröer's thesis on Wellington's duplicity or his arguments on why it was a German victory, but in the wealth of new information he provides on the Germans during the campaign. It is refreshing to read of these events through the eyes of someone other than a British officer. This book is a must read for those who are interested in Napoleonic history! Reviewed by Robert Burnham, FINS.